World Autism Day was April 2nd and it kicked off an entire month dedicated to spreading awareness about Autism Spectrum Disorder. My name is Sidney Young and I’ve been a Professional Organizer for 20 years, I wanted to share my organizational tips to help families with children on the spectrum. Creating an organized structure is important for children. They thrive on the predictability that routines bring. Children with Autism Spectrum Disorder (“ASD”) can especially benefit from living in a well-arranged home. Knowing what to expect in an unpredictable world can bring life-changing comfort and calm to children with ASD. Putting a predictable system in place at home can truly help promote focus and concentration for children with ASD. Playrooms, teaching areas and general living spaces should be organized to help alleviate stress and anxiety. These tips will help establish a starting point. Put a system in place for school, work, toys, crafts and books. This is the most important step of the entire process. Systems allow you to have set locations for easy access. Your child will find great comfort knowing where everything belongs, and where he can expect to find them the next time he wants to play with them. Color coding bins can also give helpful reminders of where things go. Remember the clear visibility is important. A great way is to play a 10 minute clean up game. This will help them not only learn where the toys belongs, and he will practice accomplishing task with follow-through, as you execute the newly established routine. Creating structure can be daunting in the beginning. But remember, these are goals you can achieve step-by-step. A little organization goes a long way and all it takes is a commitment to create a system that works for your family. Ask for help from friends and relatives. If truly takes a village- especially to organize a child’s room! These tips are just to get you started! Modify and adjust based on your child’s needs, age and ability-and enjoy the organization. March 2019 - I Love My Garage! The garage is one of my favorite rooms in the house. It’s the last place I see when I leave in the morning and the first I see when I come home. It’s my creative workshop - a home for all projects from refinishing furniture to building my latest Pinterest creation. My garage makes me happy - but I had to work to get it there. In order to really love your garage, you need to create a sense of order. You have to be able to find what you are looking for, when you are looking for it. The garage must serve you functionally, but also have enough of “you” in it to make it feel like home morning and night. Here are some simple tips to get your garage in shape enough to make you smile when that door goes up after a long day. 1. Create zones for storage and make sure everything has a home. 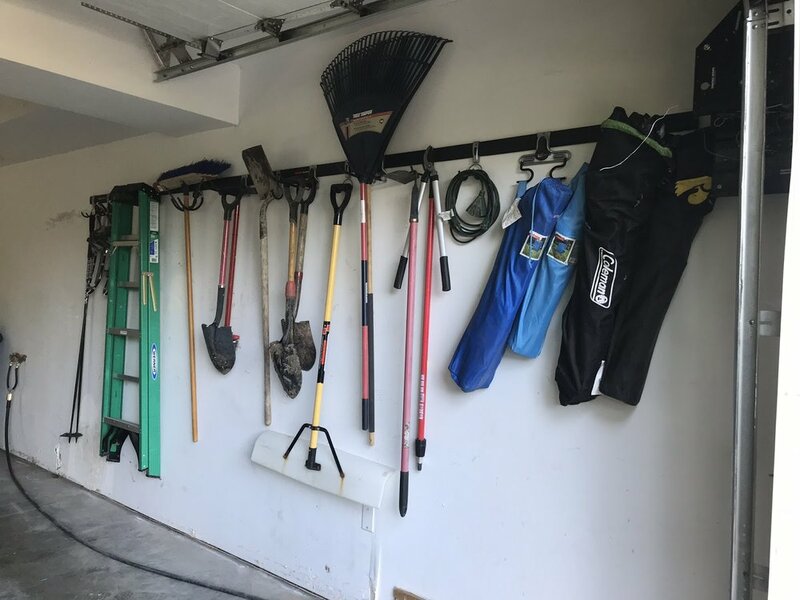 Yard tools - I like using track wall systems for rakes, shovels and all the other things that go with taking care of a yard. Utilizing wall space is one of the most important ways to save space in a garage. I like the Gladiator wall system sold at Lowes and the Rubbermaid Fasttrack system from Home Depot or Lowes. These wall systems must be screwed into studs, enabling them to hold just about anything you can imagine. Check out these examples of the Gladiator System in my garage! And here’s a Rubbermaid Fasttrack System in a client’s garage. Toys - Depending on the age of your kids, you may have lots of toys to store in the garage. Corral like items together, label and store in a way that makes it easy for the kids to both get what they want and put it away. Bicycles - These can take up a lot of space in a garage. I like to use free-standing bike racks to keep the bikes in one area. This also helps remind the kids where their bikes belong at the end of the day. In the winter months, when the bikes are not being used, I hang them to make more room in the garage. Gladiator and Fasttrack both make vertical and horizontal bike hooks for their wall systems. I use this hook I found on Amazon. My goal was to hang as many bikes as possible in the least amount of space and this did the trick. Tools - Be creative with the space you have. I love using pegboard wherever I can. It is inexpensive, easy to install and can easily be cut to any custom size. I was looking for an easy way to house cords. This is pieces of pipe with flanges screwed into the door. I used S hooks and bungee cord rings (similar bungees) to hang the extension cords. This freed up a 3 foot section of my wall system. Shoes - I do not have a mud room. When you enter my house from the garage you go directly into the kitchen. So I created my own mud room. We keep all of our shoes in the garage. This really does cut back on the dirt that is tracked into the house. The shelves are inexpensive melamine with upright tracks and brackets. This ClosetMaid ShelfTrack system is similar. There is a container of dog food and garbage containers from Ikea that house garbage, plastic grocery bags, paper grocery bags, reusable grocery bags and dog toys. There is a recycling bin to the left of the door and a shelf I found on the curb. The shelf holds dog treats, sunscreen, lunch bags and I screwed hooks to the side to hang umbrellas. Seasonal Storage - Rearrange your garage as necessary for each season. In the picture above the plastic drawers on the right hold hats and mittens. In the spring their contents will go in the bins on top and the drawers will hold flip flops and sandals. In the spring, the sleds go in the attic and I bring down my garden art and flower pots, the outdoor cushions go out and the bikes come down. 2. Don’t let your garage become a dumping ground for things you no longer use. Put a box for donations somewhere in your house or garage. It makes it much easier to get rid of things you no longer want if you have a place to put them. As soon as the box is full take it to your nearest donation drop off center. Let me know if you need help organizing your garage or any other area of your home. The people who know me best know I’ve never met a garage I couldn’t organize or a Pinterest challenge I wouldn’t tackle. Home projects, particularly of the chaos-to-order sort, are my passion. So much so that I launched happy.healthy.home., transforming my cathartic hobby into a professional business. 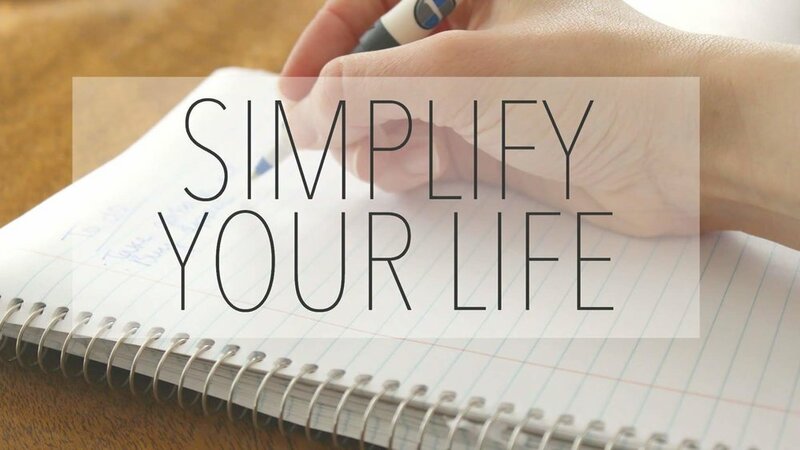 For the past year, I’ve been on a mission to simplify lives by taking away the stress associated with never-ending clutter and a lack of functional space. And boy, has this been an amazing year! I learned that you really can accomplish anything you set your mind to (no matter your age!) - like figuring out how to actually use Facebook and Instagram - not just scroll and snoop. I did things way outside of my comfort zone - like being interviewed for a television feature - and things I had never done before - like presenting to a packed audience of strangers. I worked harder than ever before in my life and in turn (or perhaps because of it) I am happier than I have ever been. And you know what the best part is? The reaction from my daughters. The pride on Isabel’s face when she told me she watched my TV interview over lunch with friends. The education and encouragement Gracie gave when I was working on my first presentation. The “good job” I get when I tell them I acquired another client. It’s been icy. It’s been frigid. There have been snow days, ice days, and freezing temperature cancellations. It’s Mid-February in the Midwest. We are cold. We ache for spring, for sunshine, for longer days and for warmth. The consensus seems to be that everyone is feeling a little grumpy, a little bitter. “Blah” or “Grrrr” are words that are coming up a LOT lately for my clients, friends and family. But I will not submit! I want spring too, but I will not give life to the negativity. I will not jump on the blah wagon. This is a great time of year for indoor projects, like sorting photos for example. As I spend this frigid February day sorting some of my photos, I’d like to take this blog as an opportunity to share some moments from where our Organizers have been and some thoughts about where we are heading. I hope you enjoy this walk down memory lane! The first long distance job that SOS Organizers did was back in 2007. It was for a long time client who had purchased a winter home. We got him all organized and packed for his new adventure and after we dropped him off at the airport, we began driving his car from Iowa down to his new place in Arizona. Here’s a few shots from our trip. There’s a picture of our happy client, as well as one from the Red Rocks of Sedona and another from a super cool cactus nursery that wasn’t far from our clients home. Until then, I had absolutely no idea how many cactus plants bloom and how colorful and absolutely beautiful the flowers can be! While in Arizona, we took one day of our trip to travel to the Phoenix area to do some shopping and see the sites. One of the places we were most excited to visit was The Container Store! A few years later, we came full circle, when along with fellow IPO Organizer Maggie Jackson, we had the pleasure of meeting Cecilia Boone, Co-founder of The Container Store, at the Annual Iowa Women’s Foundation Awards Luncheon! A few more exciting celeb sightings! 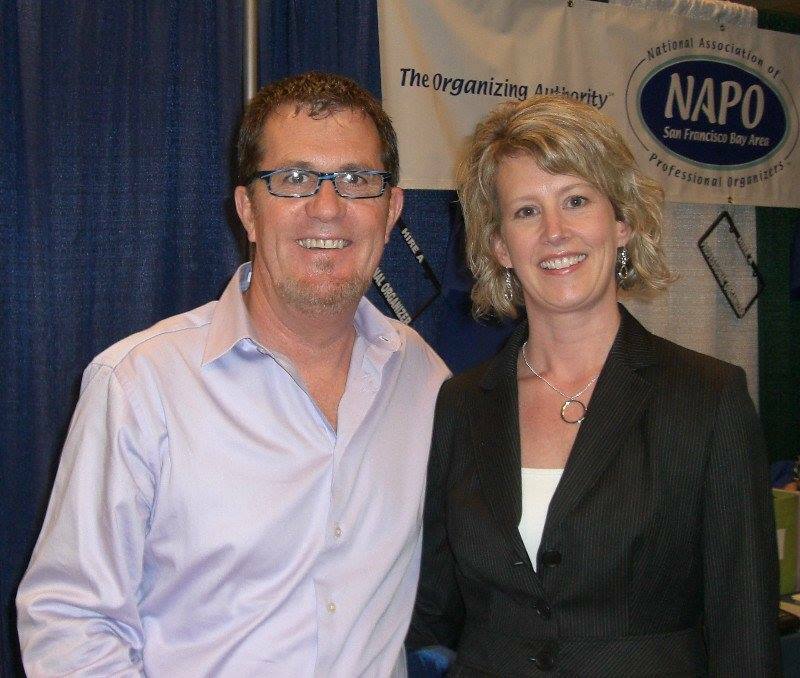 Several years ago, Lori Vande Krol had the chance to meet Peter Walsh, star of HGTV program, Clean Sweep, AND she had the opportunity to give away an autographed copy of her mentor, Barbara Hemphill's book, Less Clutter More Life. The best part of IPO over the years has been the friendships that have formed. Looks like Lori Vande Krol and Michelle Kuiken had a blastie at NAPO convention (beauties in blue). And from 2009, then IPO members Jennifer Buser and Sandy Rackis at Simple Organizing Strategies 5 year Anniversary party. All of the Organizers in attendance coincidently wore little black dresses. This picture is even more special since it is one of the last celebrations we had with IPO Organizer Joy Bayshore before she lost her battle with cancer in 2014. Professional Organizers are asked to speak quite a bit. I’ve spoken for cardiac survivor and cancer support groups, independent and assisted living centers, Chambers of Commerce, for bereavement groups, libraries, the Knights of Columbus, and at Wellness Fairs. Organizers like me also teach continuing education classes at local Community Colleges. We’re everywhere taking on everything. We have passion for what we do and we are changing the world. I even manage to find ways to incorporate basic principles of organization and wellness into fitness and yoga classes that I teach. 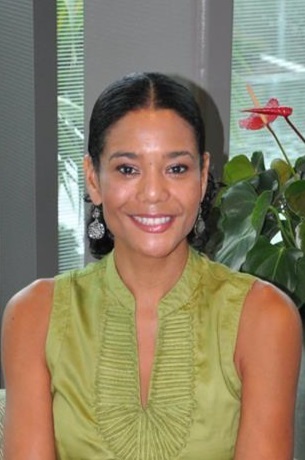 Maggie Jackson added ‘the Walk Coach’ to her business, The Organized Life. Organization is all around us and affects everything we do throughout the day so it’s no surprise the number of people who want to hear what organizers have to say and who want to know our secrets! Organizers can also make a routine of visiting local TV news programs and offering informational segments on anything from office paperwork to kitchens and pantries. From garage organizing to preparing for Holiday guests. Check out some snapshots of news segments from over the years. I wish I could find footage of one of my first spots. It was in the Quad Cities in 2004 for Paula Sands Live for a segment on Organizing and Baby-Proofing the home. I wore a white turtleneck sweater underneath a buttoned up suit jacket with slacks. I thought that’s what “Professionals” looked like, lol. I was just a baby starting out my new career at that time, and thank goodness, since then I have learned to embrace who I am and to dress in a way that suits me and makes me feel comfortable. Seriously, don’t be surprised if I show up in cat pants these days. With Marie Kondo’s Netflix show following the release of her New York Time’s Best seller, along with shows like Hoarders and Hoarding: Buried Alive, compounded with the New Year and 50% of people resolving to live a healthier and more balanced life, there is a lot of fuel on the Organizing fire right now. Just recently, Anne Ahmann of Happy.Healthy.Home was featured on a Des Moines area news segment while I was invited to appear on an Iowa City story. Get used to seeing more of our smiling faces! Then and now. It has always been our goal to grow and to learn. To lean on each other for support, guidance and wisdom. Iowa Professional Organizers are a valuable resource to each other and to our clients. We are a network of like-minded caring humans who reach for more each day and encourage those around us to do the same. I am so proud of my Iowa Professional Organizers. My friends. My colleagues. And just like every great long distance relationship, we find a way to make it work. Thanks for joining this look down memory lane. Stay tuned as we look towards the future. We can’t wait to share our experiences with you! Grab your sunglasses, it’s going to be bright! In this month that celebrates love, I would like to suggest that you show some love for yourself by slowing down. And let me clarify right away – slowing down does not mean stopping completely. It simply means downshifting to a healthier speed. Plus, February’s 28 days gives us a perfect opportunity to test out some new behaviors for a period of time that some experts suggest allows new habits to form. Rather than declare New Year’s resolutions, I am on my second year of carefully selecting actions to guide me and to keep me true to my hopes and dreams. I’m pleased to report that the inaugural run in 2018 went remarkably well, and I honored my list more than even I expected. Some of these actions certainly will be easier than others. Some will naturally happen in my daily routine. Others will be far more complicated. What does stillness look like? Yet I know the items on the list that are the most challenging also will be the most important for me to grow as human being. Help – who needs help? Slowing down is a big focus for me this year as each of the above-mentioned items require it. The remarkable community of bright, thoughtful and clever individuals who have embraced minimalism are teaching me many ways to slow down, as a beautiful side-effect of owning less is that you actually have time...time to be curious, embrace stillness, listen wholeheartedly. And, probably most important to me, more time to spread kindness. I hope that coming year is filled with many slow moments of pure peace and contentment for you and your family. Set intentions for the coming year and allow yourself the time to embrace them. January 2019 - New Year, New Decor! For many people, myself included, dismantling our cozy, holiday homes can leave us feeling a bit sad and our homes a bit bare. On the other hand, I love starting the new year with a clean slate for decorating! I have so much fun moving furniture pieces around, rummaging through the house to find accessories to display, creating new stacks of books, and switching out pillow covers and throws. When decorating your home post-holidays, you want to make reference to the winter season still ahead without appearing as though you just haven’t taken down your holiday decorations yet. This transition from Christmas to winter can be tough (and not just for decorating) but I’m going to give you some tips on how to achieve a warm, cozy sanctuary you’ll love snuggling up in until Spring! 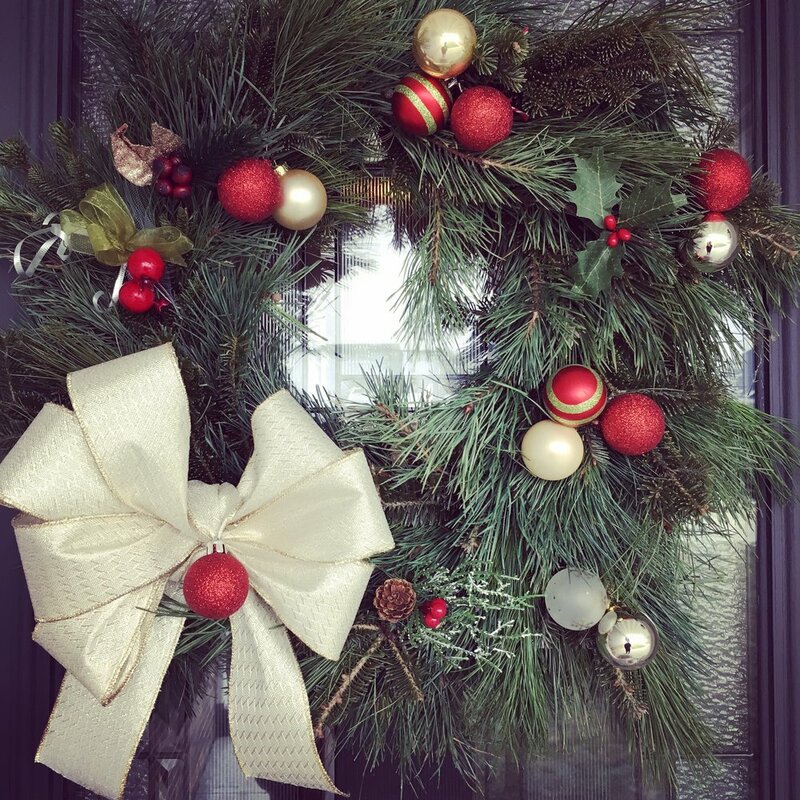 Keep your wreath – If your holiday wreath doesn’t scream “Christmas”, then leave it out! If it’s made up of holly berries or red and green ribbon, then switch it out for another beautiful wreath. Wreaths can be used for décor year-round. Whether it’s a floral wreath, a yarn strung wreath, or a twig wreath, just find one that reminds you of the season and it will easily add style wherever you hang it! Layer textiles – Fabric is such a versatile material because it can add pops of color, pattern, and texture to a room. In your home, you probably have several materials you can build around already. Some examples include upholstered furniture, throw pillows, blankets, poufs, rugs, curtains, and fabric wall art. Layering your room with a variety of these different fabrics will make it feel warm and comfortable while adding interest and dimension! Bring Nature In - In those winter months when the trees outside are brown and bare, having living plants in your home brings the beauty of nature inside and helps you look forward to the new life that lies ahead in the spring. Vibrant, fresh flowers in a vase or a green, leafy plant will instantly uplift your home and your mood! Nurturing an indoor garden or just some potted herbs also allows you to foster your green thumb even in the winter. Accessorize with wood - In addition to having other natural elements such as plants and flowers in your home, incorporating wood gives a space warmth, texture, and an organic touch. Wood can be introduced in a variety of ways from the structure of the home such as beams and flooring to the furnishing and accessories. If you don’t have much wood in the architecture of your home, you can add wood elements with furniture, bread boards, bowls, and photo frames, to name a few. Use fairy lights – One of my favorite things about decorating my home for Christmas is the warm, cozy ambience of all the twinkling lights. Just because Christmas is over, doesn’t mean you need to ditch all the lights. Battery operated fairy lights are a great option for creating this ambience. These pretty, little wires with tiny lights can be used in so many ways to create a cozy atmosphere. You can string them across a fireplace mantel, illuminate a glass hurricane, add them to a decorative bowl, run them along your dining table centerpiece- the options are endless! For more tips and ideas, contact Stacie Langan of Pretty Simple Decorating & Organizing Quad Cities, or find her page at www.iowaprofessionalorganizers.com. Happy Decorating! It’s January. Time to take a big, deep breath! The weather may still be frightful, but the craziness of the holidays is behind us. January not only marks the start of a New Year, but it’s also a time of new beginnings. For many people, this is a time to reflect on the past year and to set new ambitions for the year ahead. No matter what your New Year’s Resolutions are, following through can be a daunting task. I encourage you to take baby steps and to keep on walking until you have reached your goal! For example, if your goal is to have a more organized house, tackle one area at a time. You might simply start with one cabinet, then a closet and then a room. Although everyone is at different places in life, the premise remains the same. Getting Organized saves time, saves money and reduces stress. In this season of life, my organizing systems revolve around the needs of my family, including elementary aged children, so I completely understand that one of the common goals in households with children is to get a handle on paper clutter. Specifically, how to organize all the papers and crafts they bring home from school. Often, these papers don’t hold any value and just need to make their way into the recycling bin. However, the big question is how to store all the things you DO want to keep in an organized way? You may also have a few stacks of Christmas cards or Holiday crafts your kids made that you’d like to keep, but if you don’t have a system for storing them, they will probably just sit in a pile and clutter up your counter tops until the 4th of July! If paper clutter happens to be a sore spot in your home, remember again, to take baby steps. Start by separating the items you want to save and weeding out the items you don’t. Then, utilize a storage system such as the one below to keep everything organized. In my home, I keep a plastic file box for each family member, which I call “keepsake boxes.” The children’s boxes have individual file folders for pre-school through grade twelve. Obviously, those higher grades will not be getting filled for quit some time, but it’s nice to just have the box ready to go. In my boxes, I like to keep things such as report cards, school work that my kid’s put a lot of effort into, special art work, and cards that my kids get for their birthday or other holidays. Organizing all your keepsakes by grade level saves from having to label everything. I also have keepsake boxes for my husband and me, but they are organized a bit differently. We are often getting cards and art work from our kids or from each other, so our boxes have a separate file folder for each one of our children and our spouse. When I get a Mother’s Day card from my son, I put it in my box in his folder and when I get a birthday card from my husband, I put it in his folder. Similar to the grade level system in the kid’s boxes, dividing up my box by family member allows me to know who the item came from without having to label everything. Pretty Simple Decorating and Organizing serves the Quad Cities area. Fore more organizing and storage ideas, check out my business at: facebook.com/prettysimpledecorating.organizing. Live outside of the Quad Cities area? You can also find all the help you need with home and office organizing projects across our great state by checking out our amazing Organizers and Efficiency Consulting Professionals at: www.iowaprofessionalorganizers.com. 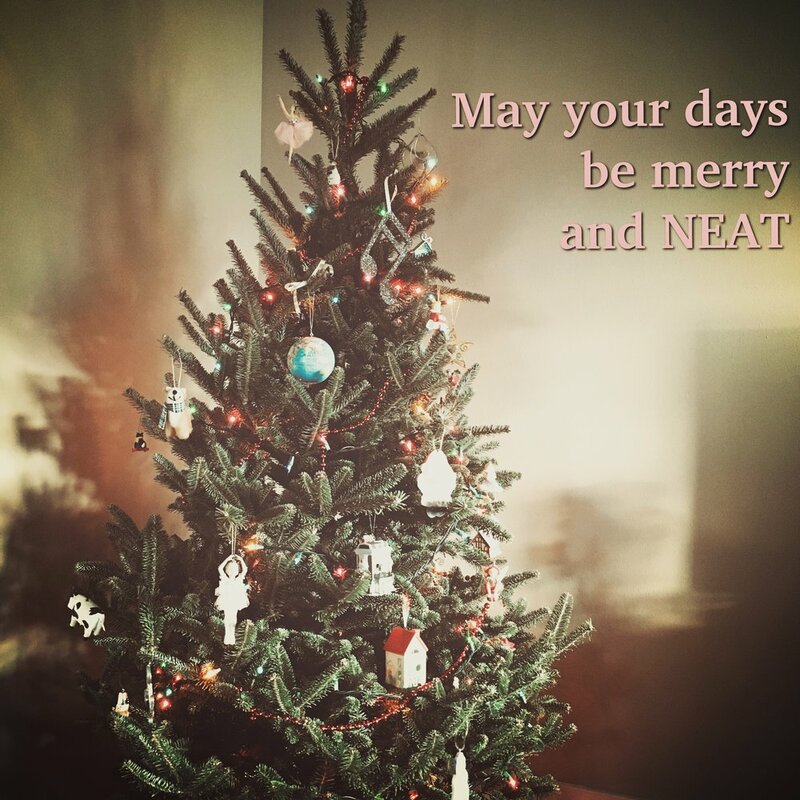 May you find peace, joy and a life of Organization in 2019 and beyond. Happy New Year From IPO! There’s no doubt about it, the holidays can be a stressful time for most people. From shopping to cleaning to cooking, it may seem like you simply can’t keep up with the demands others put on you (not to mention the demands you’re likely putting on yourself). December should be a month of reflection, celebration, and enjoyment! It’s time to do yourself a favor - take a 5-minute break to read through my “gentle reminders” and consider how following them could bring you peace and joy in the coming weeks. If you’re at all like me, you have a hundred thoughts and ideas popping into your head throughout the days. People are probably counting on you to follow through on commitments. Don’t be the one to drop the ball! Write everything down in a single list that you can consult to check your progress. I like using the Notes app on my phone since I know I’ll always have my phone with me. When was the last time you scheduled time for yourself? I often find if I just wait for some free time to find its way into my day, it will never come. Be proactive and plan ahead! Even setting aside just 20 minutes to read a book, work on a craft, or sit quietly without distractions can make a world of difference for your peace of mind. We all know it’s easy to be “too busy” to care for our physical bodies. Believe me, I know ALL the excuses (because I’ve used them). With all the stresses and sweets that come with the holiday season, we owe it to ourselves to try and stay ahead of those lethargic feelings that make us just want to lay on the couch or crawl into bed at 5pm. Don’t worry if it’s too cold outside to go for a walk or you can’t find the motivation to change into your exercise attire for a workout at the gym – there are other options! Search for a quick workout video on YouTube, go to the mall (just be careful not to let the activity become window shopping), or turn on the radio and dance around your living room! I can’t count the number of times I’ve had a “Practice Gratitude” article pop up on my social media news feeds. Research boasts that the act of intentionally being grateful can reap great benefits. We are often reminded to be grateful around Thanksgiving, but I don’t think anyone would argue with my recommendation to incorporate into your lifestyle year-round. With the technology we have at our fingertips today, it’s easier than ever before. It only takes a few seconds to shoot off an email, text, or tweet to express your gratefulness for a friend or family member. If you’re really into it, you could keep a gratitude journal to make notes of what you are thankful for each day. I find that I’m most grateful during the holiday season, and I like to express my gratitude with gifts. Disclaimer: As a self-proclaimed “minimalist”, I am very careful to ensure my gifts are not adding undue clutter to anyone’s space. To each their own. You should treasure the space you spend your time in. Whether that’s your home, your office, your car – you deserve for that space to bring you a sense of calm. Make sure your space is clean and clear of clutter. If you’re expecting to receive gifts at the end of the month, this might be a good time to go through your current things and consider which items you could discard or donate. Out with the old, and in with the new. Iowa Professional Organizers is here to help – find an organizer near you! December 2018 - Members Members Members! December is here! Membership in the Association of Iowa Professional Organizers continues to grow and we would like to take this opportunity to highlight ALL of our spectacular members and to help you find just the right Pro Organizer or Efficiency Consultant for your next project! IPO was created in 2006 in order to be a resource for Organizers and Clients alike, and has grown to include more diverse and experienced members while simultaneously becoming a stronger resource for clients! Founding members include: Jennifer Robb, Maggie Jackson, Lori Vande Krol, Donna Schoeppner and Noelle Carroll. This means your bases are covered from Council Bluffs, through the Des Moines and Iowa City areas all the way into the Quad Cities with seasoned IPO veterans. Over the years, IPO has had the pleasure of adding new Organizers, from many areas of the state like Michelle Kuiken from NW Iowa, Linda Stoolman of West Branch, Jenny Fruin of Iowa City and Laura Lord, who travels between Riverside and Reinbeck as she Organizes AND cares for aging members of her family. In addition, Sidney Young is a fantastic Organizer who recently relocated to Iowa City from sunny Florida! More recently, our newest members include Iowa City Organizers Britni Piegors and Katie Buswell (both of whom are also certified Yoga teachers, yay)! Anne Ahmann, Amy Maach and Daphne Christensen, all serving the Des Moines area, and Stacy Langan of Bettendorf, who's focus is on interior design and who serves the entire Quad Cities area! 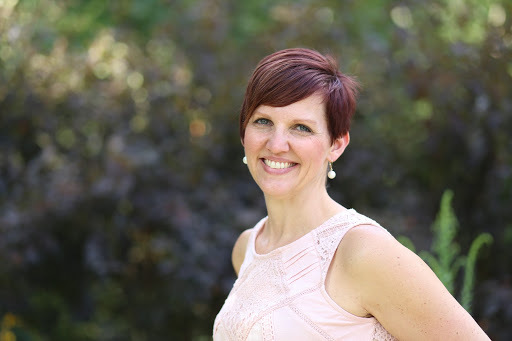 Last but certainly not least, our newest member, Renee Anderson, Owner of Sensible Space Solutions serves Mason City and Northern Iowa Clients! No matter your needs or location, IPO is here to help. What are your goals for 2019? Is it time to overcome paper clutter once and for all? Is it to get a handle on your schedule, priorities and time? Are you ready to tackle that spare room, storage area or garage? Don’t Agonize. Organize.